There was a Vlad Tepes, and there is a Transylvania. (Where is Transylvania? In Romania). 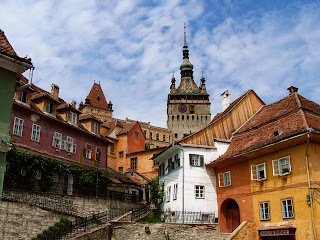 The problem is that readers of the novel Dracula will often comment that there was also a Count Dracula since Bram Stoker did a wonderful job of writing about Transylvania. People forget that it is a work of fiction, but is set in a real place, and that the author based the character on a person who lived in the area. Vlad Tepes was one of the many Princes of Wallachia, and he was born in Transylvania while his father was in exile there. He was on the move much of the time during his adult years, either fighting for his throne or fighting his enemies. People either loved or hated him. Transylvania, although not the land he ruled, was a place where he was exiled or where he fought other people. It is interesting that the stake through the heart to kill Count Dracula, or his vampires, was Tepes's method of torture and killing of his enemies. Unlike "newer vampires" he was not harmless. Yet, while no one argues that the man was kind and caring to his enemies, he was generous to his followers. Transylvania has benefited from the Count Dracula novel and character. There is a large castle, called Bran Castle, that people come and see because it is the one that Tepes was supposed to have lived in for a time. However, there is no mention specifically of Bran Castle in the novel. One city in Transylvania is mentioned, and that is a city which in the Northern part of Transylvania, and it is Bistriţa It is important for people to have interesting places to visit, but they also need history and books to show them what they should and should not believe.